NOTE: The following posting was written in the blog’s infancy under a banner that has since changed. 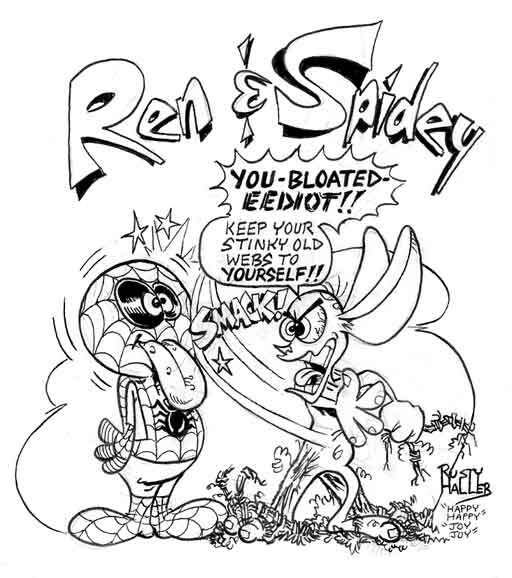 Artist Rusty Haller was a good friend and talented creative soul who contributed spot cartoons for several postings during the site’s first year until his heartbreaking and sudden death (see “Goodbye, Rusty…”). He will always be missed. Amid the the deluge of emails, letters, faxes, phone calls and wires that I am inudated with daily concerning Heroes In My Closet, one question pops up more often than zits on a tween working the frialator at Mickey Ds: Who drew your banner? At first I thought these queries stemmed from members of the artist’s family using pseudonyms or a lunatic cosplay fringe group trying to undermine my blog because of some ill-conceived impression that I was unjustly muscling in on their territory. But it quickly became evident that there was more than a passing interest across the board in my banner Michaelangelo, which, I have to admit, tends to bruise the ego some. After all it’s my blog. What part of Heroes In My Closet don’t you understand? It’s all about me...me, me, ME! All kidding aside (No, really...I was joking), I can certainly understand my blog-faithfuls wanting know who did the wonderful banner that adorns this site. RUSTY HALLER is the talented fellow’s name and I count myself very fortunate to be able to call him “friend.” I first became aware of Rusty when I was writing articles for Marvel Age magazine, Marvel’s own periodical pat-on-the-back that provided info to its fans on everything from future plotlines to behind-the-scenes exposés on creative personnel, production...whatever. Rusty provided humorous single-panel comics from time to time and, quite enjoying them, I asked the editor how I could contact the artist in hopes of purchasing some of the original art. I got Rusty’s number and called. It wasn’t long before our conversation went from my kudos for his art and his grateful thank-yous to geeking out over our mutual love of classic cartoons and toys. Thus began our friendship. Rusty’s knowledge of obscure television shows and commercials put me to shame. It was like the difference between shooting a bullet and throwing one. He'd send me videotapes of never-aired pilots, long-forgotten commercials and shorts that were produced only for studio personnel. Did you know that in the mid-60s there was a proposed Wonder Woman show conceived and executed by the same team that made the Batman television series (No, I’m not talking to you with the bootleg lost episodes of Cool McCool—I know you know! I'm talking to those outside the realm of geekdom.)? It was so corny, it reeked of ethanol, and so cheesy, I was on Lipitor for months after seeing it. But I loved it...and Rusty knew I would. Then there’s the animated Winston cigarette ad featuring the characters from The Flinstones. Overcome with guilt from watching Wilma and Betty working in the yard, the two take a break behind the house to enjoy a Winston cigarette. It’s so wrong and cool at the same time. Rusty’s work has appeared in such cartoon and TV-show inspired comics as Ren & Stimpy, ALF, Danger Mouse, Duckula, The Flinstones; and in coloring books, most notably featuring art inspired by the recent Go Teen Titans cartoon series. 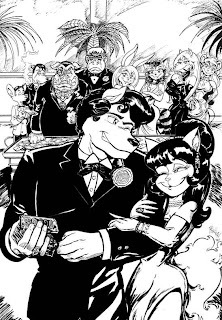 In recent years, he’s begun Ace and Queenie, an anthropomorphic James Bond-meets-Hart-to-Hart adventure comic that’s filled with puns and visual gags. The series runs sporadically in Furrlough, a comic book for aficionados of anthropomorphism, and on its own eponymous website.